Submitted by Susan Miller on Sat, 11/15/2008 – 16:36. What follows is a nomination written by Martha Eakin and me, edited by Ohio Environmental Council’s director, Keith Dimoff, for Cleveland’s Biodiversity Alliance awards in 2007. Ed was not deterred by being told “Ed, it’s not going to happen, everybody is opposed to it. The issue is over with.” Ed’s extensive experience with the ways of government has taught him that he cannot rest until the land becomes part of the Cleveland Metroparks, ensuring that it will remain permanently protected public greenspace. Ed’s activism was documented on film: Link to Blue Hole Film, Citizen Hauser. Anyone who cares that the place where the Cuyahoga River pours out into Lake Erie remains undeveloped – one of the few areas where a person can walk along the shore and touch the water – owes a debt to the late Ed Hauser. There’s no telling how many people he introduced to that scrap of land known as Whiskey Island, either by taking them on tours or by calling attention to the place during the many years he dedicated to preserving it. While the city of Cleveland duked it out with the county over control of the property, Hauser’s was the loudest and most substantive voice arguing for its preservation as a park. With the Cleveland-Cuyahoga County Port Authority coveting it for westward expansion, and the city fighting for control but making no promises about its future, Hauser fought against steep odds and eventually won. Whiskey Island, the peninsula bordered by the old river channel to the south, the Cuyahoga to the east and Lake Erie to the north, is now known as Wendy Park. Thanks to Hauser, it’s going to stay that way. That was one of several battles Hauser took up in his 10 years of activism following his layoff from an engineering job at LTV steel. For the past 10 years, Ed Hauser threw his entire life into saving the green corner of Whiskey Island, a peninsula with grassy fields and meadows on Lake Erie at the mouth of the Cuyahoga River. As the head of Friends of Whiskey Island, Hauser collected signatures on petitions, attended too many public meetings to count and spent money from his retirement plan in a campaign to preserve the 20 acres as a park and block expansion plans by the Cleveland-Cuyahoga County Port Authority. Hauser, 47, died Friday morning. The Cuyahoga County coroner’s office ruled he had a heart attack, spokesman Powell Caesar said. Known as “Citizen Hauser” and the “Mayor of Whiskey Island,” Hauser enjoyed seeing people use what became the county-owned Wendy Park in 2005, which has a marina, beach restaurant and sand volleyball courts and became home to several festivals. Cathy Stahurski, Ed Hauser’s girlfriend of 11 years, said she was with him when he became ill at 4 a.m. Friday morning. She said his back was hurting and he was sweaty, but he did not want to see a doctor. She finally persuaded him to go to the hospital with his sister, but he died in the car. Stahurski said Hauser was an engineer who was laid off from LTV Steel Co. 10 years ago. After that, he threw himself full time into being an activist. Besides Whiskey Island, he also served as a citizen watchdog on port authority activities, championed a steel museum in Steelyard Commons and was vocal about Cleveland’s lakefront plans. It wasn’t unusual to see him at a public meeting about the proposed Medical Mart. 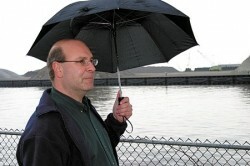 A 2006 documentary called “Citizen Hauser” chronicled his dogged activism. Elaine Marsh, co-founder of Friends of the Crooked River, said there will be activists who come after Hauser, but no one will be able to fill his shoes. Hauser was the fourth of five children born to Walter and the late Theresia Hauser. He graduated from Maple Heights High School in 1979 and Cleveland State University in 1990. He loved to kayak, and could often be found in Lake Erie off Whiskey Island. He moved from Cleveland’s West Side back into his childhood home in Maple Heights in May. Services for Hauser will be Monday at 7:30 p.m. at Vito-Nero Funeral Home, 6130 Turney Road, Garfield Heights.